Every so often, I read a blog post which takes me right back into the darkness. Right back into the days spent in the middle of the vortex with the Wicked Witch flying right past my window. I’m not going to spend a lot of time ruminating or introducing the post. I will say that if you’re vulnerable, you may want to avoid it. There’s a lot of showing instead of telling, raw honesty, and power in this post. It’s why this post by Kimberly at Reflections of Now is my pick for Postpartum Voice of the Week. 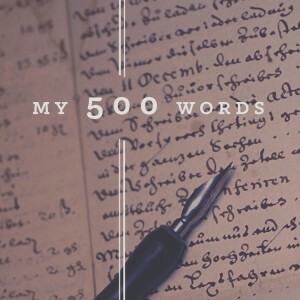 This entry was posted in Postpartum Voice of the Week and tagged mental health, mother, motherhood, postpartum depression, Postpartum Mood & Anxiety Disorders, Postpartum Voice of the Week, PPD, strength on September 27, 2012 by LHale. On Monday, my mother was practically bursting with excitement. The following is how the conversation proceeded. Sort of. Mostly. Mmmk, I’m getting older, my mind is slipping, and I have a twisted sense of humour. If you’re drinking something, put it down. No seriously. Put.IT.DOWN. And swallow that sip still in your mouth. 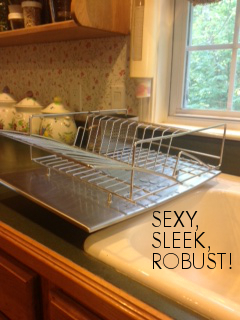 This entry was posted in Whatever Wednesday and tagged Capuchin Monkey, dishes, funny, humour, J-LO, parents, rack, stainless steel, stupid silly on September 26, 2012 by LHale. A recent research article, posted by The Postpartum Stress Center on Facebook, looks into the relationship between postpartum depression and breastfeeding. The findings? Women who breastfeed are less likely to experience postpartum depression. Mentions employed mothers who were formula feeding but the abstract makes no mention of employed breastfeeding/pumping mothers. As a blogger focused primarily on Postpartum Mood Disorders and emotional health for moms, this study raises my hackles. I’ve blogged about the whole breastfeeding v. not-breastfeeding thing during a Postpartum Mood & Anxiety Disorder thing before – several times- and each time, I conclude the same thing. YOU have to do what is BEST FOR YOU. It doesn’t matter what anyone else says, it doesn’t matter what the research says, it doesn’t matter what is best for baby food-wise. What matters here, the most, is that you are addressing your needs, healing, and doing so in a manner which alleviates the most stress and anxiety for you. Your motherhood journey is just that – yours. The only thing which matters is that you, your baby, and your family, are thriving. If your path includes breastfeeding, great. If it doesn’t, that’s great too. When you struggle with a mental illness, your emotional health absolutely comes before everything else –at least in my book it does. If you wanted to breastfeed but find it’s too stressful because of your Postpartum Mood & Anxiety Disorder, talk it over with your care-provider. Let them help you make your decision but don’t let them pressure you into continuing simply because the research claims breastfeeding is “protective” against PPD. Guess what? You’re already struggling. So unless breastfeeding is the ONE thing to which you’re clinging and the ONE thing which helps you heal, helps you feel like you matter, it’s OKAY to stop. It’s okay to use formula. Frankly, it’s sad we have to give ourselves permission not to breastfeed in this day and age. Moms use formula for a variety of reasons –as long as baby is growing, healthy, happy, and loved, it shouldn’t matter what form of nutrition is used. So go. Do what feels best for you, for your family, and for your sanity –and don’t let anyone judge you for it. This entry was posted in Breastfeeding and tagged Breastfeeding, formula feeding, mental health, Postpartum Mood Disorders, postpartum stress center, prevent postpartum depression, research on September 21, 2012 by LHale. I have a special place in my heart for women who struggle with Intrusive Thoughts. Don’t get me wrong, I have a place in my heart for all women who struggle with Postpartum Mood & Anxiety Disorders, but Intrusive Thoughts plagued me during both of my episodes. They are insidious tenacious monsters hell-bent on tearing your mind and soul apart. When I come across a post mentioning Intrusive Thoughts, I read it with a heavy heart. I know how she felt when those thoughts attacked her. The burning fear, the anxiety, the repulsion of “Oh my GOD why am I thinking like this?!? !” which catapults itself through her brain as the monster takes hold in her mind. This particular blogger, Jen, a proud member of #ppdchat, writes a heart-rendering (and potentially triggering) post about her journey with Intrusive Thoughts. She’s revisiting this time in her life as a result of a tragic event in her area this past weekend. It’s difficult, as women who have been through this, not to flash back when something terrible happens in a family near us – or even harder yet, a family we know personally. We internalize our thoughts, our fears, and everything comes flooding back, threatening to pull us under. I knew that these intrusive thoughts were not real and that they were not rational. I could not stop them from replaying over and over in my head. It took me months of therapy to realize that I had suffered from these thoughts. In order to protect myself, I stuffed those thoughts way down deep. I could not bear to bring them to the light of the day because they were just too horrible to contemplate. Jen deals with these emotions in a powerful post which you absolutely should read. As stated earlier, however, it may be possibly triggering if you’re still struggling and on fragile ground. So read her post, “Horror Show in My Mind: Intrusive Thoughts,” with a mindful consciousness and an open heart. Then show her some love, will you? She needs it this week. 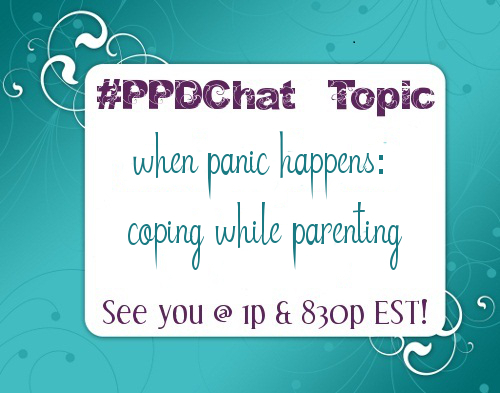 This entry was posted in #PPDChat, Postpartum Voice of the Week and tagged #PPDChat, intrusive thoughts, postpartum depression, Postpartum Voice of the Week on September 20, 2012 by LHale. Yesterday, as we hustled out the door to head to the gym at 5:00am (seriously – who does this? ), we were surprised by the downpour just outside our door. It was a soft, quiet downpour in our neck of the woods but by the time we arrived at the gym, the rain fell harder and drifted sideways somewhat, thanks to the growing winds associated with the storms heading our way. We went inside, I changed, and hopped in the pool. I swam for 40 minutes, engaged with focusing on my stroke instead of the rain just outside the massive windows next to the pool. Once in the hot tub though, I could see the rain, illuminated by the parking lot lights. It still fell quite heavily, according to a fellow soaker. The rain didn’t stop until last night. Throughout the day, it wavered between insanely driven to soft and quiet. People in the apartment complex ran to and fro, many covering their heads as they dared to venture into the uncovered spaces. I heard a few giggles from children and witnessed just a couple of adults use their regular strides as they headed to their cars. Rain feeds the vegetation around us. Without it, we wouldn’t have ancient oak trees, green grass, gorgeous flowers, delicious vegetables or fruit. We wouldn’t have the oceans, lakes, ponds, creeks, fish, and all the other flora and fauna which depends upon the very vitality the rain provides as it falls. Even though many of us don’t like the rain, it provides the means for our planet to thrive. Each of us is different. Each of us reacts to crying in our own way, just as each of us protects ourselves differently when it rains. Some of us run. Some of us use umbrellas. Some of us cover our heads with our hands or a magazine or newspaper. Some of us meander through the rain, not caring if we get soaked and enjoying the feel of every drop on our skin. Bottom line – we all cope with the rain differently. Tears are a part of processing emotion. Some of us cry at the drop of a hat or an overtly emotional commercial. Then there are those of us who hold our tears in until they burst through all our carefully constructed barriers, causing a flood as our emotions tied to those tears release. Then there are those of us who just don’t cry at all. There is no right way to process emotion. There are unhealthy ways to process emotion, yes, but there are so many variants on the healthy ways to process emotions. Just like a walk in the rain – we all do what feels right for US. Rain allows our planet to grow and thrive. 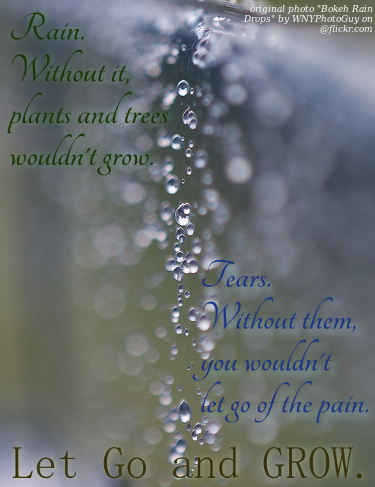 Tears allow us to grow and thrive. It’s okay to let go and cry, it’s okay to breathe deeply and open the floodgates. It’s not okay to pretend everything is okay when it’s not, to keep things to yourself if you’re hurting. What’s important is to remember you’re not alone – no matter where you live – (in a flood plain, a rainforest, a desert…) just because how you process things looks different than how someone else processes them doesn’t mean you’re wrong. It just means you are human and an individual. This entry was posted in advocate, life, tears and tagged desert, emotions, flood plain, lessons in the rain, mental health, pain, rainforest, tears on September 19, 2012 by LHale. 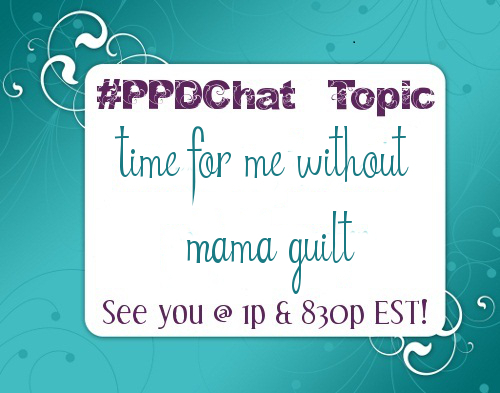 This entry was posted in #PPDChat and tagged #mhsm, #PPDChat, mama guilt, peer support, Postpartum Depression support on September 17, 2012 by LHale. Dear Researchers – if you’re going to bother to study something associated with Postpartum Mood & Anxiety Disorders? PLEASE make sure it matters and serves a purpose other than to make us worry about something that, well, frankly, isn’t worrisome. There’s absolutely nothing wrong with kids of a shorter stature and to blame it on depression is just an anxiety attack waiting to happen because yanno what? When you have Postpartum Mood Disorders, you worry about the stupid stuff like this. So thanks. No, really, thanks. This entry was posted in Perinatal Mood Disorders, postpartum depression, public awareness, research and tagged depression, DUH, idiotic studies, postpartum depression, researchers, rolling my eyes, short kids, So crazy I couldn't make it up on September 11, 2012 by LHale. 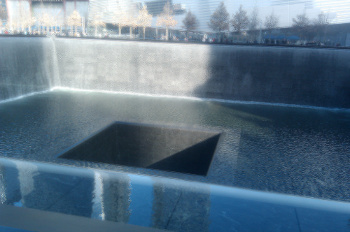 I began blogging well after the terror attacks on September 11, 2001. Even though the focus of my blog is Postpartum Mood & Anxiety Disorders, I have always tried to post something in remembrance of this day each year. It’s a day which will always replay in my mind, a day which replays in all of our minds. A day on which, we all came together as Americans swallowed whole by grief and yet spurred forward filled with intense renewed resolve not to allow our country to falter in the dreams of our forefathers. Sure I know where I was that day. As do we all. I don’t want to rehash where I was, what I was doing, how I watched the second tower hit live on TV, the first tower fall, and then the second tower. We all know where we were with intense detail. 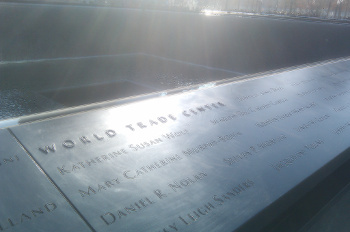 What I want to share with you today are two separate events – one involves a road trip last September 11, the other involves my visit this past December to the Memorial Site in NYC. I’ve already blogged about the road trip because frankly, it took my breath away. But I’ll rehash it here. I was on my way to Georgia to visit with my kids. I had NPR on because they were broadcasting the services from NYC and then from the Pentagon. As I listened to this coverage, the requisite moments of silence, I drove. Not a tear. Not until Spartanburg, SC. In Spartanburg, SC, patriots gathered on the first overpass over I-85 with all the American flags and then some they could find. They stood on that overpass, waving their flags at all the passing traffic, covering it on either side with the symbol of America’s enduring freedom. I lost it. Tears poured forth at this raw yet powerful show of patriotism, a stark reminder that when it comes down to it, we are ALL AMERICANS. Then, as I turned off the interstate, I pulled off to the side of the road for a motorcade of motorcycles riding in memory of 9/11. I stayed there for a good 10 minutes, out of respect for their ride and the day at hand even as other vehicles raced past me. I sat there, blinkers on, quietly respectful. 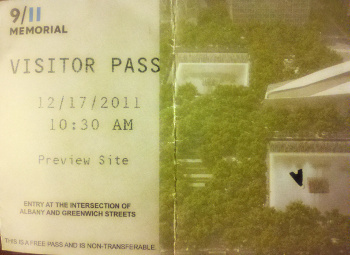 This past December, while visiting a friend in Northern NJ, we planned a day of sightseeing in NYC. He advised me to think about what I wanted to see while there so we could plan our travels across the city. 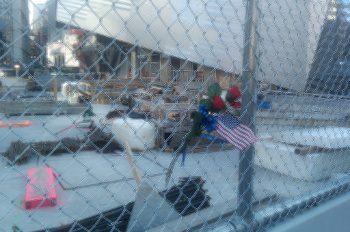 As I thought, long and hard, I realized there was nothing I wanted to see more than the WTC Memorial site. How could I be in NYC and *not* visit? Once I decided to visit the site, I braced myself. You see, I have this knack for sensing emotions and feelings when I visit places. Given that this was a site of such tragedy, such heartbreak, such…..darkness, I had no idea what to expect so I began to steel myself against the barrage of what I was sure would be negative emotion as early as I could. Walking into the site is a somber, somber experience. Everyone is quiet. Sure, some people are talking, but their tones are respectful. We move toward the entrance to the site. There are no less than 4 security checkpoints, one which is Airport grade, requiring you to remove jackets, bags, etc. You have to keep your ticket out at all times to prove you are supposed to be there. Once we got into the site, we walked quietly for the most part, talking a bit here and there. I was taken aback completely. Not by the beauty of the monument, but by the sense of peace and beauty filling the space. I prepared myself for an onslaught of anger, frustration, sadness, and god knows what other negative emotions. But instead, there was peace, love, acceptance, solitude and solidarity, completely blowing me away. 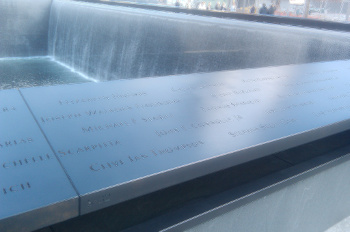 You can search for names at kiosks on the far side of the memorial. We walked around both towers. 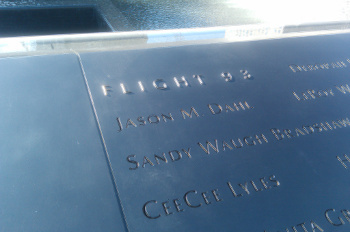 I couldn’t help but reach out and trace some of the names etched into the memorial. Families milled about, people by themselves, friends, etc. In that space, just as on September 11, 2011, we were all Americans paying respect to lives lost in what my generation and those not alive for Pearl Harbor will remember as one of the most atrocious attacks on American Soil in our lifetime. I am glad I went. My friend thanked me for wanting to go inside as he’d never been even though he lived just 30 minutes away via train. 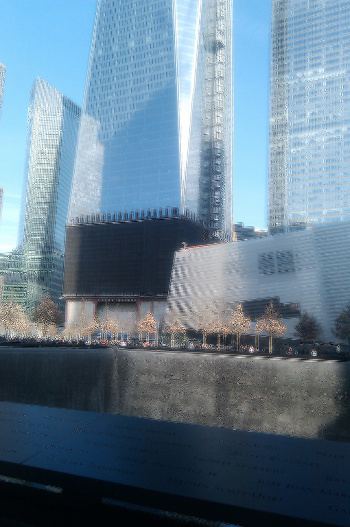 New York has done right by the victims of 9/11 with the memorial. Sure, there are people who argue they haven’t or will criticize other issues surrounding 9/11 from a political standpoint. 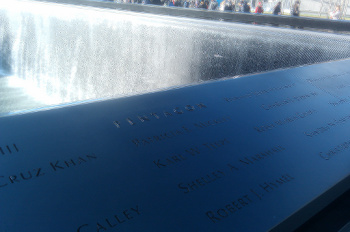 But the enduring peace and solidarity I felt inside that memorial space is all that matters to this American. Thank you to the first responders who rushed toward the towers as they burned. Prayers and thoughts to the families and loved ones of the victims lost that day, to those who survived the day. Thank you to those who rushed to sign up to fight for our great nation and defend her honour. Thank you to those who worked tirelessly to clear the rubble after the towers fell. Thank you to those who worked endlessly to ensure the memorial site was a respectful one, as you succeeded. May God bless America as we continue to heal from this tragedy. May we never, ever forget and always, not just today, but every day, be grateful for the freedoms we hold dear in this country and always be ready to fight to keep them. 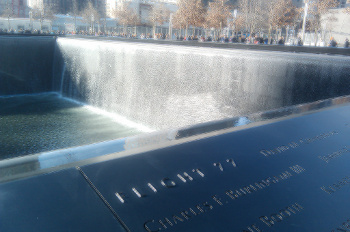 This entry was posted in blogger, life, public awareness and tagged 9/11, 9/11 Memorial, Americans, freedom, grief, New York City, Patriots, Spartanburg, Twin Towers, World Trade Center on September 11, 2012 by LHale.